World Red Cross and Red Crescent Day on May 8th celebrates the idea of helping people in need and shows appreciation for the people who volunteer with the International Federation of Red Cross and Red Crescent Societies. The American Red Cross, founded by Clara Barton on May 21, 1881, shares in this international celebration. It is an opportunity to underscore the American Red Cross mission of advocating for the relief of human suffering from disease, famine, disaster, or war at home and around the world. The American Red Cross in Washington, D.C. is not a government agency but a charitable organization that depends on volunteers to perform their mission. The first World Red Cross Day was celebrated on May 8, 1948. The date was chosen to honor the birthday of Henry Dunant, the founder of the International Committee of the Red Cross and recipient of the first Nobel Peace Prize. The official title of this day became World Red Cross and Red Crescent Day in 1984 to include the work of the Red Crescent organizations in Muslim countries. At present, the international organization has adopted three official emblems-the Red Cross, the Red Crescent, and the Red Crystal-to symbolize its neutrality and humanitarian mission to all countries in the world regardless of political, cultural, or religious affiliations. The National Red Cross, Crescent and Crystal Societies in each nation can also include a local symbol to advocate their domestic efforts. VOA podcast on Clara Barton: A Life of Caring for Others. This podcast about Clara Barton's life is 16 minutes long. The first part talks about her childhood and her working experience as a teacher and a document writer in the government. The middle part (6:25-12:08) is about her achievements in relation to the American Red Cross. If time is limited, you may want to play this particular section for your students rather than the whole podcast. If you would like to edit the podcast, you can use Audacity, a free online audio editor. Why did Clara Barton decide to work on the battlefields even though it was not permitted at that time? How did she change people's perception toward women and nursing on the battlefield? What did Clara Barton do in Europe? While she was in the hospital after coming back to the United States, what did she do? What were the results of her campaign? While she was the president of the American Red Cross, what did she and the organization do? After the students listen, have them work in their groups to make a list of her achievements or contributions to the United States. If there is enough time after each group has constructed a list, you may want to play the podcast again. Ask students to check off the items from their group's list that they hear in the podcast. They can also make any corrections and additions that they notice are needed. Bring the class back together to retell the story of her achievements by calling on each group to add one part at a time until the story is complete. Prepare information about humanitarian organizations, such as International Federation of Red Cross and Red Crescent Societies, Peace Corps, Medecins sans Frontières/Doctors without Borders (MSF), World Health Organization (WHO), World Food Program (WFP), etc. Divide students into small groups. Assign each group to read about or research one organization for 20 minutes. Then, ask each group to create a mind-map, either on paper or by using bubbl.us (a web-based mind mapping tool to guide students through the brainstorming process) to help them compile the information they found about the assigned organization. When they are done, ask each group to make a presentation to the class. 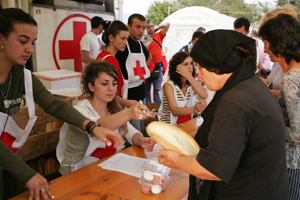 There are about 170 National Red Cross and Red Crescent Societies around the world providing a wide variety of services, ranging from disaster relief and assistance for the victims of war, to first aid training and restoring family links through volunteers. Do you know if there is one in your country? Research and find information about the organization in your country to share with the world.